Recently, I've been learning Ruby as a second scripting language. But one topic I never covered with the many lessons online were sockets. So I did some research and came up with a very simple client/server connection that sends a string over the socket. 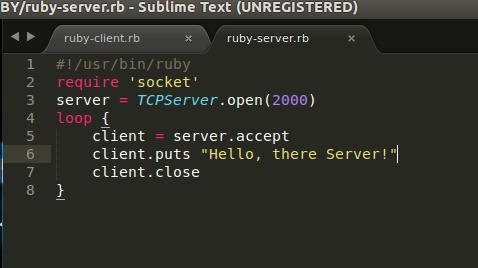 Line 1: The is the shebang It tells our system to use the ruby interpreter for this file. Line 2: Ruby comes preinstalled with a socket module so we have to include it in this program. line 4 & 5: Here we are setting some variables. You can set these to whatever you like but for the sake of this tutorial, I am connecting to my machine on port 2000. This command makes all ruby files in this directory executable by all users. In the first one, execute the server script. You won't see any output just yet. In the second terminal, execute the client script. Hit enter and you'll see the the string we set to send when we connect to the server. This is only a simple connection but, if you want me to add something to it to give it more usability, just ask. Or you can do it and post a link in the comments! Also, I want everyone's opinion. Should I start a series for Ruby. Like I teach the basics with some projects in there? Yeah. Ruby has a lot more functionality that comes with it than python. I'm gonna start the series tomorrow I think. Great article! Really got me back into the whole development scene! Thank you! Thank you, this really encouraged me to learn Ruby. You can make a very simple trojan from this script.